The gallbladder is located next to the liver and merely stores the bile fluid that the liver makes. 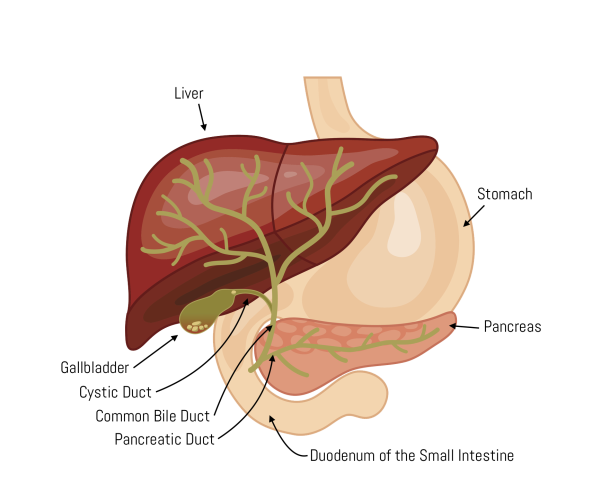 Your gallbladder releases this stored bile into the common bile duct which flows into the small intestine. Your body uses bile to help digest fatty meals. Patients can live a healthy life without a gallbladder. After your surgeon removes your gallbladder, bile will flow directly from the liver down the common bile duct into the small intestine. ​ ​Gallstones present inside the gallbladder can cause problems including pain (biliary colic), infection (cholangitis), and biliary obstruction. When the gallbladder is abnormal, people often experience pain in the right upper quadrant of the abdomen or upper middle abdomen just below the breastbone. Frequently, this pain is suddenly intense and occurs after eating a fatty meal. Fever may accompany infection. Biliary obstruction can cause jaundice (yellowing of eyes and skin), pale stools, dark urine and pancreatitis (painful inflammation of the pancreas). Pancreatitis and cholangitis are emergency situations. Gallstones in the gallbladder can cause pain in the upper abdomen. The best treatment for gallstones which cause colic, pancreatitis, or cholangitis is the removal of the gallbladder. This kind of surgery is called a cholecystectomy and is usually done laparoscopically with small incisions. Much less frequently, your surgeon will determine that it is better for the patient's safety to make a more extensive incision. Your surgeon will often perform an x-ray of the bile duct which is called a cholangiogram to determine if any stones are present in the bile duct. Sometimes, gallbladder pain can occur when gallstones are absent. In this case, the gallbladder doesn't empty well. Your physician will determine this by ordering a HIDA scan to reveal a low ejection fraction. Removal of the gallbladder is one of the most common procedures done by a general surgeon. Robotic surgery has allowed for enhanced techniques in laparoscopic gallbladder surgery as well.